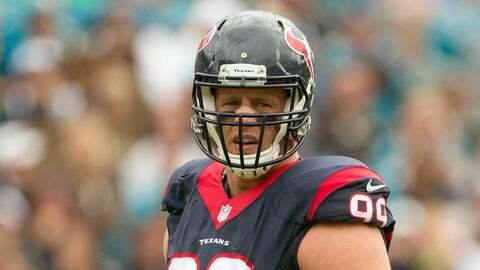 J.J. Watt was questionable for Sunday's win over the Jaguars with an illness. Despite being late addition to the Houston Texans’ injury report with an illness, J.J. Watt took the field as expected in Sunday’s 31-20 win over the Jacksonville Jaguars. Although the star defensive end didn’t record a sack while playing sick, he did make his presence felt. Watt, who was downgraded to questionable for the game on Saturday, finished with two tackles, one quarterback hit and one batted pass. "It was all right. I’m just tired now," Watt said, per ESPN. "It was a good win. It was a good win for our team. Great day. …We got a good win. I just need a nap and a lot of sleep." The 2014 NFL Defensive Player of the Year said he wasn’t quite certain when he got sick. "Couple days ago. (Saturday)? I don’t even know," Watt said. "It’s ok. We got a good staff and they took good care of me." While Watt didn’t record a sack, his teammates helped picked up the slack, getting to Jaguars quarterback Blake Bortles three times. Linebacker Whitney Mercilus had a game-high two sacks.